This hard-rocking four-piece – comprising singer/lead guitarist Tyler Kinder, rhythm guitarist Jazz Morrice, bassist Alex McMillan, and drummer Pete McMillan – are making their first hometown appearance for the year at the Golden Vine on Saturday, March 9. 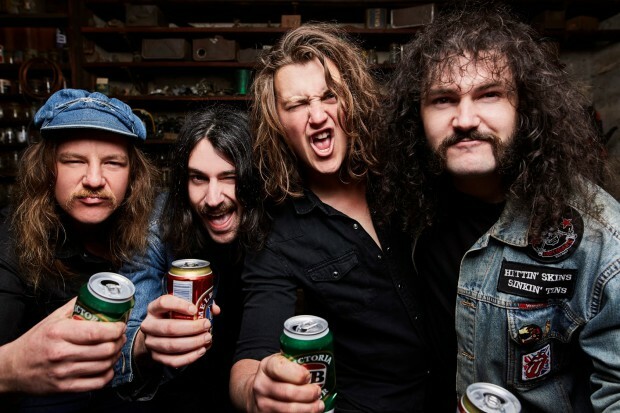 Black Aces channel the greats of Australian rock, having impressed Twisted Sister’s Dee Snider – with whom they shared the main stage at the 2017 Hard Rock Hell festival in Wales – so much that he compared their music to vintage AC/DC. Listeners can also add Rose Tattoo, The Angels, and Slade into that mix. There is new material in the offing this year from the band, whose previous album, Anywhere But Here, came out in late 2017. This second album was written in a garage in Bendigo, and produced by Australian stalwart Mark Opitz (AC/DC, Cold Chisel, INXS) and Colin Wynne (Adelaide’s Bad//Dreems). Anywhere But Here was followed by an extensive period out on the road, including an early 2018 tour of the United Kingdom – the band’s third jaunt to the Old Dart in 18 months. They will be supported at the Vine by Melbourne outfit Ramblin’ Gold, featuring former Black Aces guitarist Rhys Collier. From 9pm; entry $10. A week earlier, on Saturday, March 2, the Vine plays host to a diverse triple bill featuring Castlemaine synth-rockers World Turtle World, psychobilly-rock exponents Dead Lurkers, and psychedelic loop specialist Row Boy. From 8.45pm. The Axedale Tavern will host its Buskers’ Day grand final on Sunday, March 3. Six local finalists who have made it through the previous three rounds will duke it out for the grand prize of $500 and three paid gigs at the Axedale this year. The winner will be determined by a public vote. From 1pm; free entry. On Friday, March 8, Melbourne-based singer-songwriter Nathan Powers will offer up his engaging folk, blues and country medley at the Handle Bar. His most recent single, Walking Wounded (Coconut Records), was released earlier this month. From 6pm; free entry.